Air or fluid actuated from 90 to 110 psi. Maximum torque (1559 lb. ft.) and higher engagement speeds (1800 RPM). 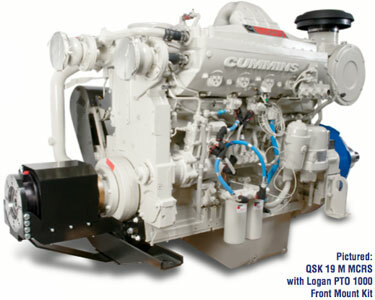 The low profile, compact, Logan PTO design is suitable for workboats, fishing boats and pleasure craft. The Logan PTO aids in the reduction of emissions, fuel costs and wear and tear on auxiliary attachments. Engagement up to 1800 RPM’s with optional SoftstartTM. Installs in minutes with simple hand tools. Engineered Mounting Bracket for Precise Alignment. Outputs: SAE C and SAE D pump flange or popular Dana shaft adapors available. 1000 lb. ft. of rated torque @ 90 psi.- 110 psi. 547 HP @ 1800 RPM. Clutch shown with cover plate removed.